Everyone knows a Jedi Master is only as good as his skill with a lightsaber. Jedi tradition dictates that new Padawans construct their own lightsaber from scratch, but we understand that it's a difficult accomplishmen because Kyber crystals are rare. And who has the time to sit down and build a lightsaber these days? Certainly, not us! Are you in the market for a lightsaber that’s powerful, efficient, and incredibly stylish (who wouldn’t want a purple blade? If you simply don’t have the time to pore through countless schematics or you're lacking the energy to focus on lightsaber construction, then you need our Mace Windu Lightsaber Accessory. 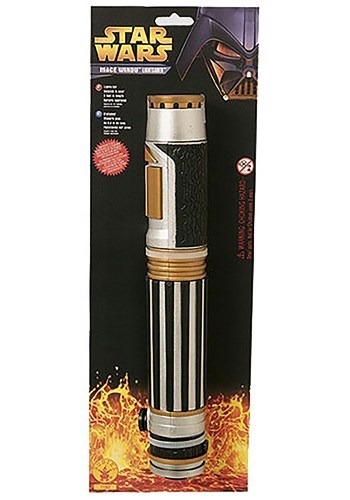 With this replica of the great Jedi Master’s lightsaber, you’ll be taking the fight to the Sith in no time! Just remember this: watch out for the treacherous Sith and their nasty Force Lightning!